It’s been almost a full month now since I went semi-meatless. The best part of this process has been coming up with new recipes to eat. So I thought I would start sharing some of them. 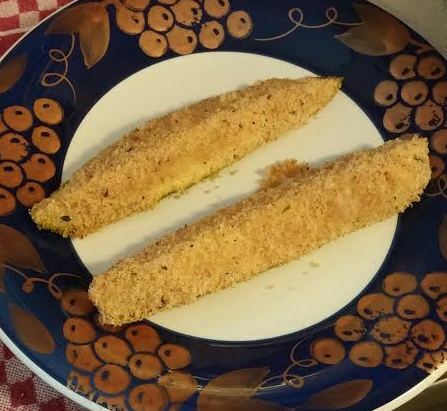 The first one is Breaded Zucchini Sticks. Zucchini is one of those vegetables that is easy to grow but we usually have too much and we get tired of eating it because we don’t know what to do with it besides salads or stir fry. So we usually end up giving it away. Last year I found a Zucchini Christmas Jam recipe that helped use some of it up, and the year before that I was canning zucchini relish. I mixed together some seasoned bread crumbs, Kraft Parmesan cheese, and salt and pepper. I spread the mixture out on a dinner plate. Then I sliced the zucchini into four spears. I coated each spear lightly with coconut oil and then rolled them in the bread crumb mixture. I put the spears on a cookie sheet and baked them in the oven for about thirty minutes at 350 degrees. That’s it! The spears were cooked perfectly. They were nice and tender. And don’t worry…the coconut oil does not give them a coconut flavor. You could probably use a different oil or butter of your choice. The crumb mixture gives them a nice light breaded flavor. This is definitely a dish I’d make again. Mix the bread crumbs, Parmesan cheese, and salt and pepper together and spread on a dinner plate. Cut the zucchini into four to six spears. Coat the spears with the oil. Roll the spears in the crumb mixture and then place on a cookie sheet. Bake at 350 degrees for thirty minutes. I could easily see these deep fried and served like fries with some horse radish or ranch dressing too. Yummy! But if you follow my recipe and your zucchini is about eight inches long, two spears is only 80 calories and has 5 grams of protein and only about 3 grams of fat. Enjoy! What do you do with your zucchini during the summer months?